Beautiful colors on this McCoy vase! 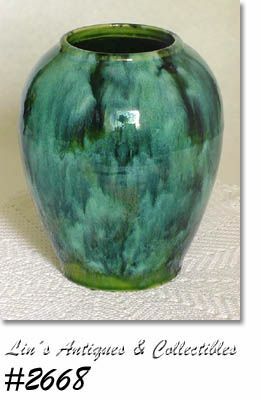 It's urn or oil jar shaped, measures 6 5/8" tall, and is in McCoy's blended green colors known as green onyx. I purchased this lovely vase at an estate sale in Indiana. The vase has always been pampered -- it is in excellent condition with no chips, no dings, no cracks, no crazing! 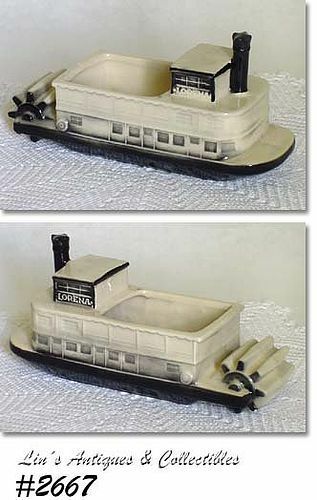 This is a difficult to find McCoy planer -- the Lorena paddlewheel! Planter is black and white, measures 8 3/4" long, 3 1/8" wide. It is marked on bottom: Bicentennial Project of Zanesville, Area Chamber of Commerce,1976, USA, McCOY. 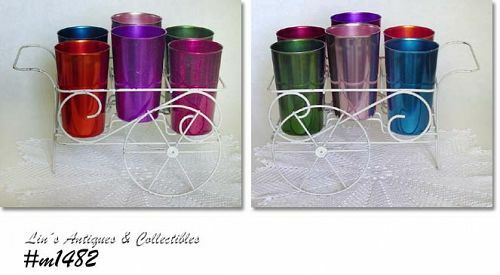 This listing has 4 Bascal tumblers in softer colors than the other setw we just listed! There's a green, light blue, silver, and gold color -- each measures 4 3/8" tall and are in wonderful condition with very minor "use" evidence. Very pretty!! 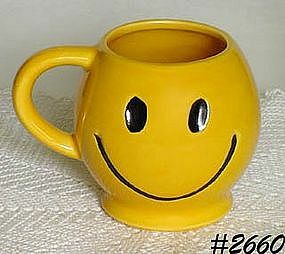 MINT CONDITION MCCOY HAPPY FACE MUG! THIS ONE IS IN THE DARK YELLOW COLOR WITH SHINY GLAZE AND HAS BLACK EYES AND SMILE. MARKED ON BOTTOM: MCCOY (IN CIRCLE WITH LINES), USA. MUG LOOKS NEW AND UNUSED! 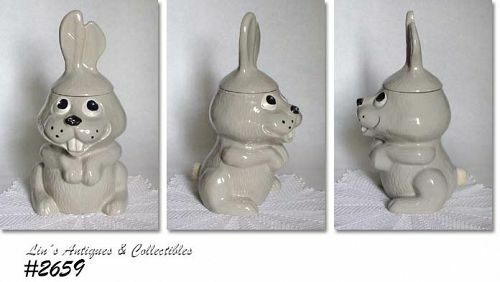 This listing has a neat McCoy cookie jar -- it's Hocus Pocus rabbit! Jar is shaped like a rabbit, is gray color, and measures 13 1/2" tall (to tip of ear). It is in wonderful condition with minor "use" evidence. It has 2 small dings (3/16" and 1/16") on lid rim under the edge. The jar has a 1/8" ding on dry (inner) rim of jar. The jar retains approximately 95% of the original cold paint! Bottom is marked: 211, McCoy, Lancaster Colony (mark), USA. I purchased these two Brush clover pieces together and I am listing them as a set -- they appear to have been together a very long time! The pitcher is the refrigerator type (measures 7 1/4" tall at tallest) and is marked on bottom: K11, USA. The bowl is the largest bowl from a nested set (it was also sold as a salad serving bowl) and is marked on bottom: K10, 9, USA. Bowl measures 9" diameter and 3 1/4" tall. 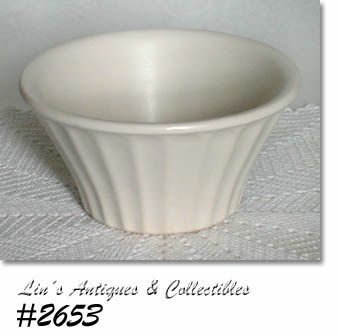 This listing has a planter or bulb bowl from McCoy's Floraline line. It measures 3 3/8" tall and 6 1/4" diameter. Planter is a lovely white color with a semi-matte finish. Bottom is marked: Econo-Line, USA, 502. McCoy items marked with the Econo-Line mark are not everyday finds! 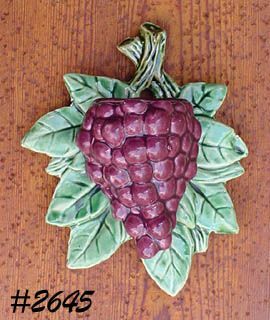 McCoy produced the Floraline pottery line for the florist trade and most pieces are simple in design. This planter is prevented from being plain or harsh by having a simple picket fence type design. 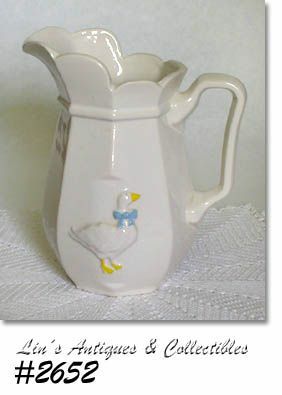 This listing has a very attractive McCoy serving pitcher from the Country Accents line! It is in wonderful condition -- has a 1/4" glaze ding or flake-off at bottom edge that is not detrimental! MADE IN 1946, THIS UNMARKED MCCOY PLANTER IS DIFFICULT TO FIND! 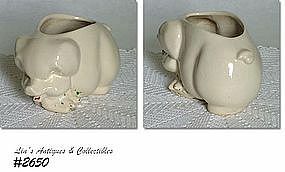 SHAPED LIKE A LITTLE PIG, PLANTER IS A SOFT WHITE COLOR WITH SHINY GLAZE AND HAS REMNANTS OF COLD PAINT ACCENTS. IN EXCELLENT CONDITION -- NO CHIPS, NO CRACKS, NO CRAZING! HAS BEEN USED AS INTENDED AND HAS A LIGHT STAIN LINE -- THAT'S IT! CUTE. CUTE LITTLE TWIN SHOES PLANTER BY MCCOY! UNMARKED PLANTER IS IN A BEAUTIFUL PINK COLOR WITH SHINY GLAZE AND IS IN EXCELLENT CONDITION. ONLY "USE" EVIDENCE IS A VERY LIGHT STAIN LINE -- THAT'S IT! ANOTHER OUTSTANDING MCCOY WALL POCKET! THIS IS THE PURPLE GRAPES AND IT IS IN EXCELLENT CONDITION. ONE LEAF HAS A 1/8" DING ON THE UPPER EDGE -- THAT'S IT AND IT IS NOT DETRIMENTAL!! BEAUTIFUL COLORS. ABSOLUTELY MINT CONDITION MCCOY BASKET SHAPE PLANTER! MADE IN 1957, PLANTER HAS YELLOW INTERIOR, EXTERIOR HAS BASKETWEAVE PATTERN AND IS YELLOW WITH TAN COLOR ACCENTS. MARKED ON BOTTOM: MCCOY, USA. MEASURES 6 1/2" TALL (TO TOP OF HANDLES), 8 3/4" LONG, 5 1/8" WIDE (AT CENTER). PLANTER IS IN EXCELLENT, LIKE NEW CONDITION AND HAS BEEN A PART OF MY MCCOY COLLECTION FOR MANY YEARS. BEAUTIFUL ITEM! 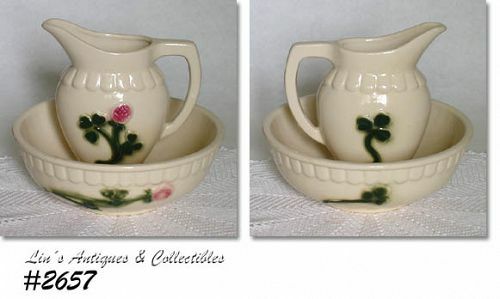 This listing has a beautiful McCoy hanging basket planter made in the 1940s! It is a gorgeous aqua color with shiny over-glaze. Planter measures 4 1/2" tall and 6 1/4" diameter (at top). 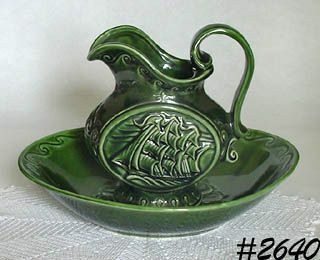 This is one of McCoy's most attractively styled pitcher and bowl sets -- the Clipper Ship! 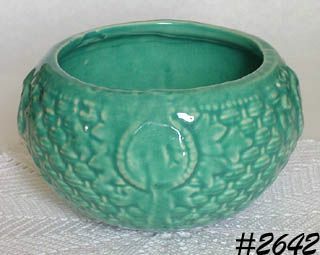 The pitcher and bowl are dark green with darker green accent color and have shiny over-glaze. The bowl is oval shape and measures 11 5/8" long, 9 1/2" wide (at center), 2 5/8" tall. 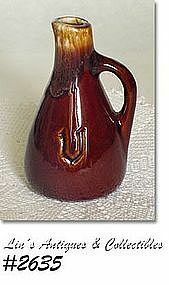 Pitcher is 7 3/4" tall (at tallest) and is very decorative with in-mold clipper ship on both front and back of pitcher. Both pieces are marked: 7512, McCoy (in circle with lines), USA. 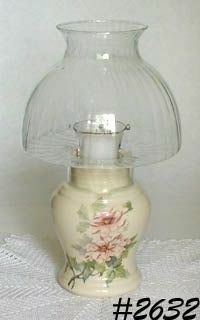 This listing has an absolutely mint condition McCoy Pottery candle lamp! The pattern is what I have named pink peonies -- an off-white color background with flower blooms in shades of pink and leaves in shades of green -- lovely! These candle holder lamps were produced with several different syle glass chimneys/glass globes -- the one on this lamp is particularly striking and pleasing to the eye. BEAUTIFUL UNMARKED MCCOY SWAN PLANTER! MEASURES 5 1/8" TALL (AT TALLEST), 2 1/2" WIDE (AT WIDEST). DETAIL IS EXCELLENT AND THE COLOR IS A SOFT YELLOW WITH A SEMI-MATTE GLAZE. IN WONDERFUL CONDITION -- HAS AN INTERIOR 1/2" SUPER TIGHT HAIRLINE (LIKE A PENCIL MARK) AT BACK EDGE -- NOT DETRIMENTAL. 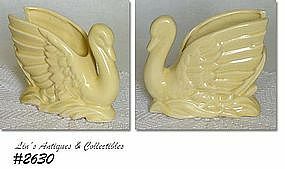 THESE SWAN PLANTERS ARE DIFFICULT TO FIND AND SELDOM FOUND IN THIS COLOR!